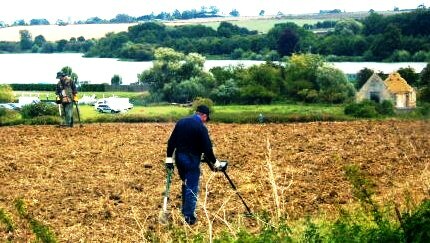 Portable Antiquities Scheme to support a metal detecting sales push! "I'm doing it for the good of British history, honest." "Oh really? Then you won't be keeping anything you find, will you?" But that’s not all. Apart from detector retailers, detector distributors and detector manufacturers the only confirmed attendees are… the Portable Antiquities Scheme! Attending (and thereby legitimising) commercial metal detecting rallies designed to make money for the rally organisers is one thing, and anti-heritage enough, but being the first to sign up to an event blatantly designed to boost the sales of metal detectors and archaeological artifacts found by their use ..? Surely that’s beyond PAS’s remit? What on earth would its founders say? Wasn’t PAS set up and financed by the taxpayer simply to ameliorate the damage caused by metal detecting, not to help increase the scale of the activity? How crazy are the British going to get with their heritage? At this rate PAS will never run out of work since it is creating its own! Let us hope there has been a misunderstanding or that PAS will re-consider dignifying this event. After all, the World Wildlife Fund doesn’t attend elephant gun sales events!